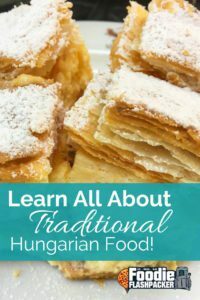 What Is Traditional Hungarian Food? During my most recent visit to Hungary, I learned much more about what makes traditional Hungarian food unique. Hungarians make use of seasonal foods, and many of the dishes focus on meats, fresh vegetables, and dairy products. I also learned that many traditional dishes are influenced by Jewish and Austrian cuisine. And of course, Hungarian food can’t be discussed without mentioning paprika. Hungarians make heavy use of the spice, and it seems to make it’s way into almost every dish, especially those with a sauce. Pogásca is a popular savory bread, like a Hungarian version of the scone. We had these several times at breakfast with strong coffee. 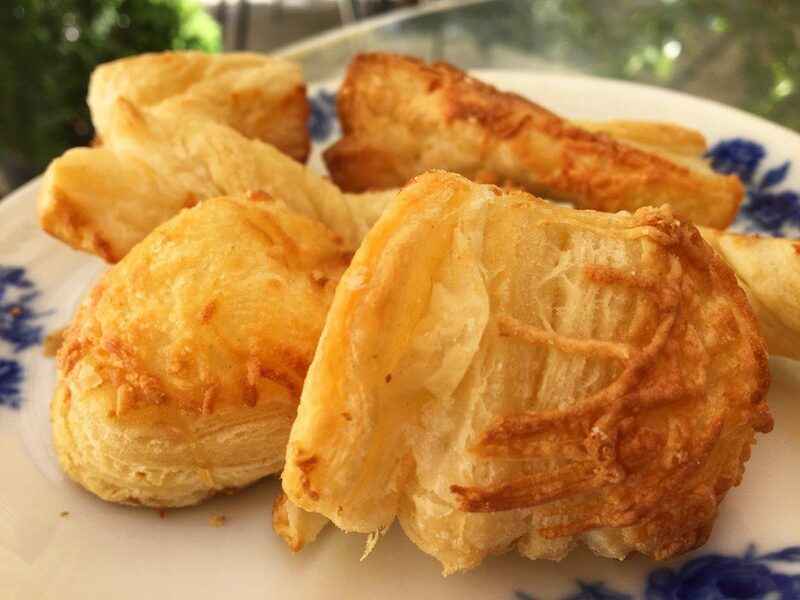 Although they may not look heavy, they are typically quite dense and filling. Flodni is a typical Hungarian-Jewish style cake. 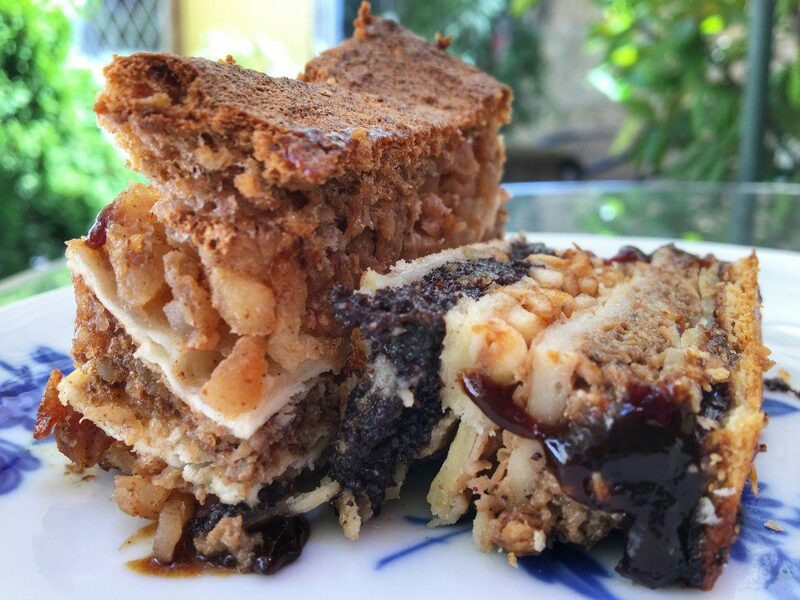 its four layers include apples, walnuts, poppy seeds, honey and plum jam. Those of you who, like me, don’t have a sweet tooth may still enjoy this cake. The walnuts and poppy seeds help even this dish out and make it less sweet. Meggyleves is the one dish I admit I didn’t particularly care for during my walking food tour of Buda. However, it is a very traditional Hungarian food, and many people loved it, so I thought it should be included. The dish is a fruit soup served cold. 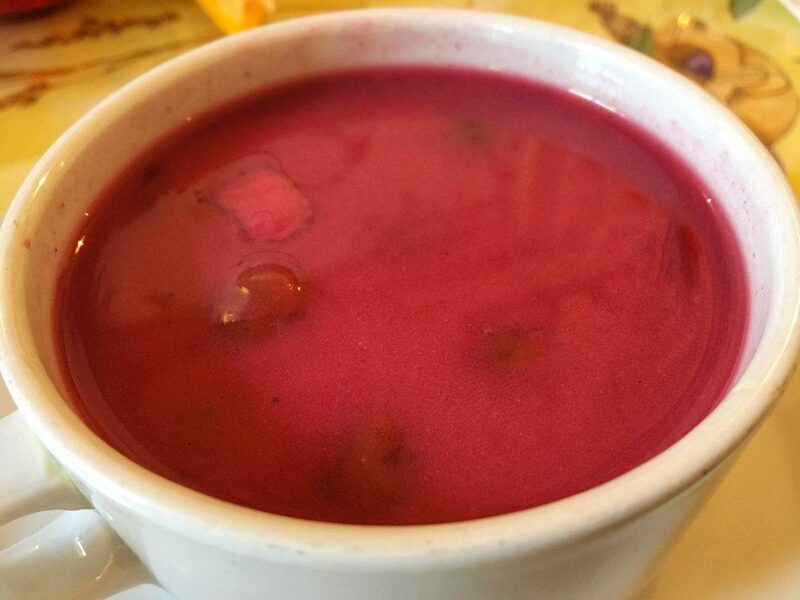 Considered a summer delicacy, it is also sometimes referred to as sour cherry soup. Resztelt máj, or liver and onions, may have surprised me the most, because I don’t typically enjoy liver. But in this dish, the liver is fork tender, the onions are perfectly caramelized, and both are served in a gravy like sauce that goes so well with the potatoes. 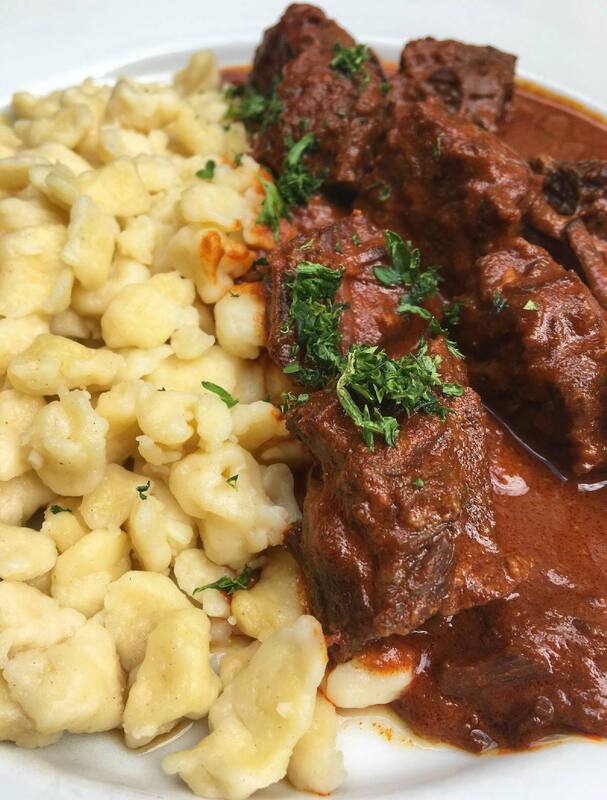 You can’t talk about Hungarian food without mentioning goulash. The stew is made with meat, typically beef, vegetables, and a heavy dose of paprika in the sauce. This version differed slightly from others, as it was served with spaetzle noodles, a possible Austrian influence I mentioned earlier. Hungarians are proud of their Mangalica pork, and for good reason. 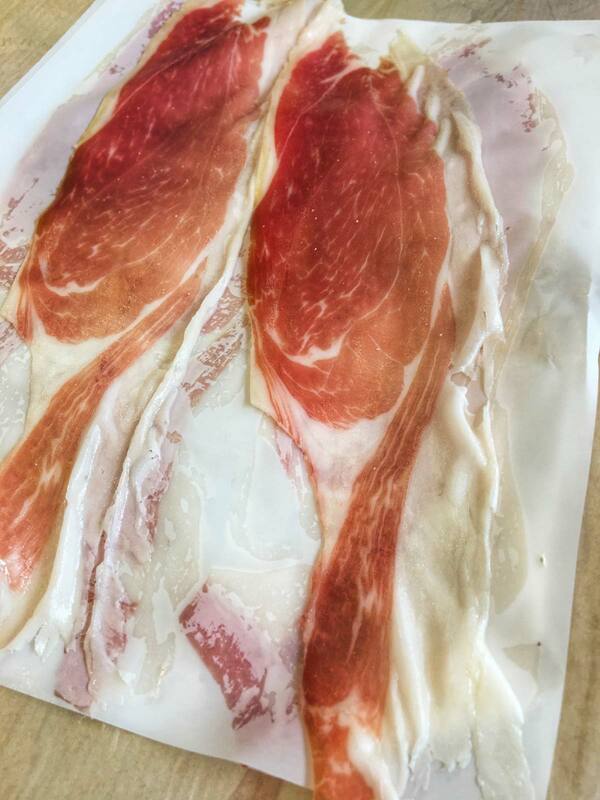 It is some of the best cured meat I’ve ever tasted. The pig is a Hungarian crossbreed of domestic pigs and wild boars. Literally translated “Mangalica” means “hog with a lot of lard”- although it doesn’t sound healthy, it’s very delicious. Cholent was easily my favorite dish from the Jewish Cuisine Walking Food Tour. 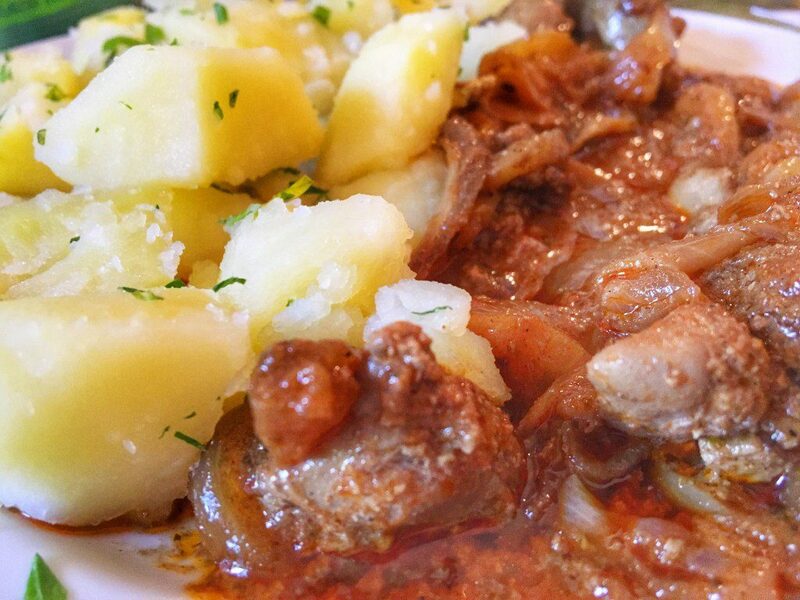 While this stew is a traditional Jewish dish, because of Budapest’s large Jewish population, it has become a popular local specialty as well. 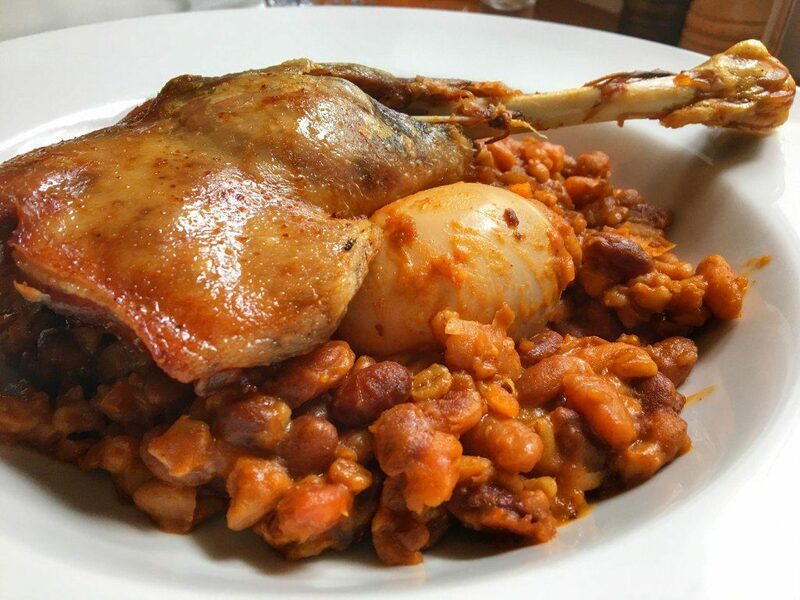 The stew is made up of beans, barley, meat (this version was made with goose leg) and whole eggs. To adhere to Jewish law, which doesn’t allow for cooking on the Sabbath, this dish is started on Friday afternoon and allowed to slowly cook overnight and eaten for lunch the next day. It’s a hearty meal and one I still crave. Hungarians take their pastries and desserts very seriously. 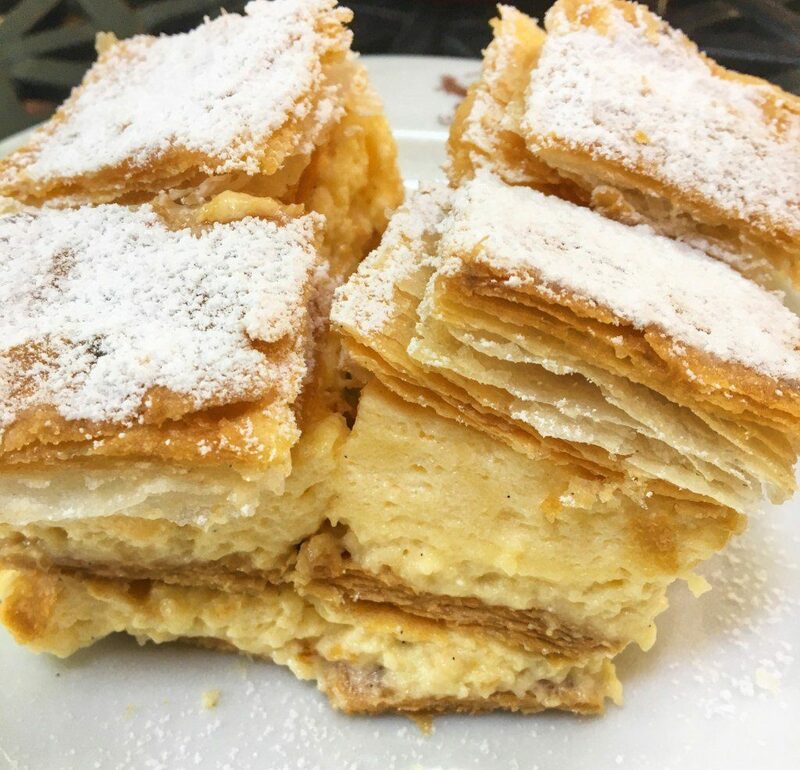 This pastry, which we enjoyed with with coffee for breakfast, was piled high with layers of flaky dough and a custard or pudding like filling and finished off with a generous sprinkling of powdered sugar. A bit sweet, but I loved the flaky crust. This fruit tart was more to my liking. 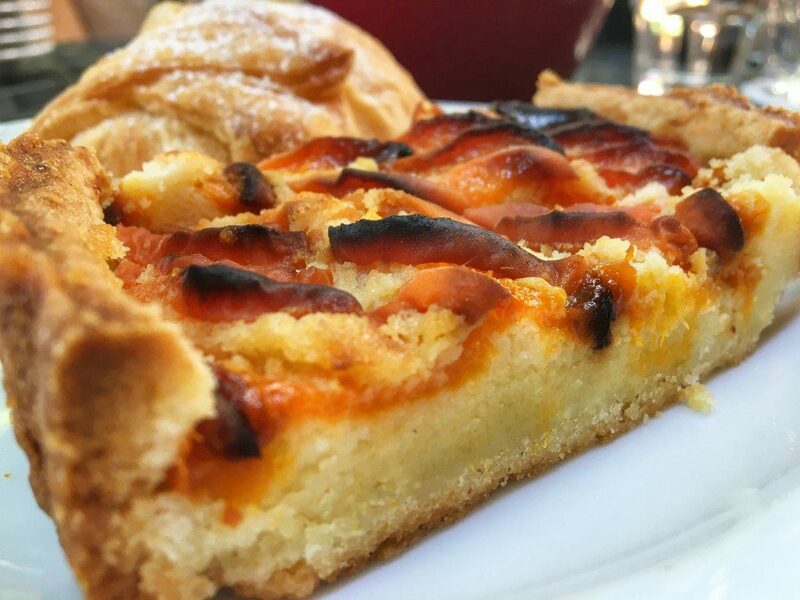 It also had a buttery crust, but is instead topped with fresh fruits baked to a chewy texture. I absolutely loved it. I know I said that I wasn’t presenting this list in any particular order, but food wise, I have saved the best for last. 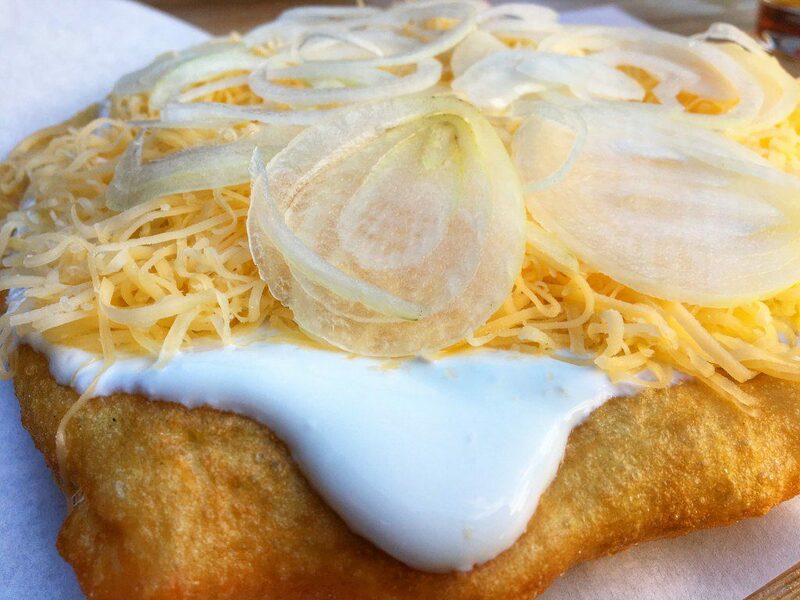 Langos was a borderline obsession for me and is quite possibly my new favorite Hungarian food. 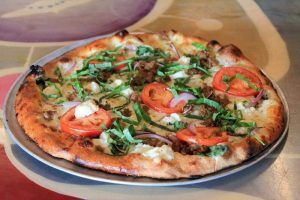 The dish is made up of fried bread with your choice of toppings. Some prefer it plain, with only fried dough. Others rub garlic oil or put cream on theirs. Some like to add onions. As you can see from my pic above, I like all of it at once! I wish this dish was healthier, because we ate it nearly every day, with, of course, an ice cold beer. These were my favorite Hungarian dishes, but the list wouldn’t be complete without mentioning some local drinks as well. Unicum, sadly, I didn’t love, but it is Hungary’s national drink and definitely bears mentioning. 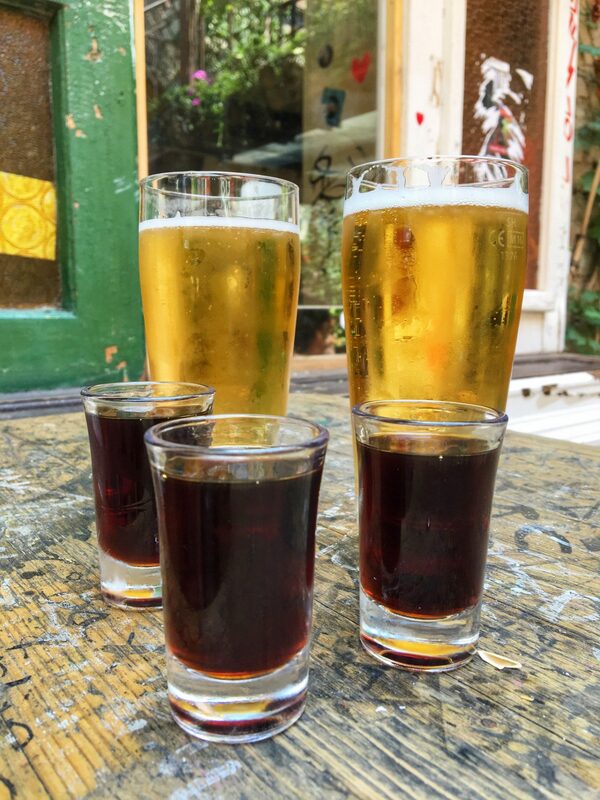 Unicum is an herbal drink drank as a digestive or aperitif and made from a secret recipe of more than forty herbs. It is aged in oak casks and, in my opinion tastes much like Jägermeister. But I did love the Hungarian wines. I feel Hungary is seriously overlooked as a producer of quality wines. Hungary actually has 22 wine regions which together produce nearly 100 local wine varieties. 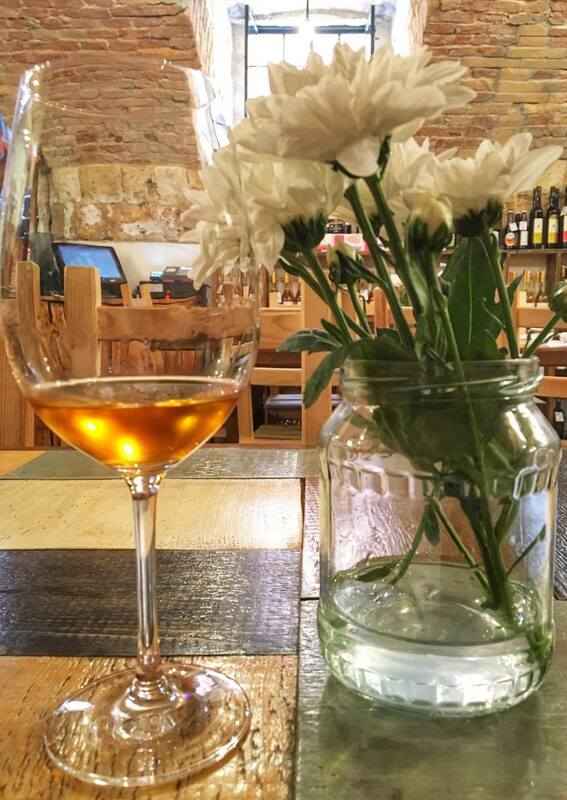 I took part in a tasting table experience with Taste Hungary that taught us much about the country’s wine production while giving us the opportunity to try some of the best bottles. I highly recommend joining them in their tasting room if you’re interested in wine tourism. Have I convinced you to try Hungarian food? Which dish looked best to you? Let me know in the comments section below! I love seeing and trying all the different foods when I go abroad. I must admit I am not sure about the cherry soup though. I tried unicum when I was in Budapest and it’s an acquired taste lol. Everything else looks delicious though, wish I had tried that authentic stew Cholent. For a second I thought you’d skip goulash 😉 But it’s there along with some things I’d truly never heard about – I mean, the Mangalica ham looks like it can well hold its own against Prosciutto and Serrano and I’ve never heard of it! Happy continued traveling & eating! You have definitely convinced me to try traditional Hungarian food – everything looks DELICISOU! I’m not sure I would be on board with the fruit soup, either, but so much of this looks amazing! I’m definitely ready for some langos, goulash and pogásca (and not just because I haven’t had lunch). 🙂 I’m not much of a beer drinker, but I would happily volunteer to taste test some Hungarian wines. Thanks for sharing! I had no idea that Hungarian food was influenced by Jewish and Austrian cuisine, but I do know how much I love goulash. The sour cherry soup actually sounds delicious to me, and you introduced me to so many dishes I’d never heard of. This post took me back to my trip to Budapest. Hungarian food can be hearty but it’s so rich and full of flavor. 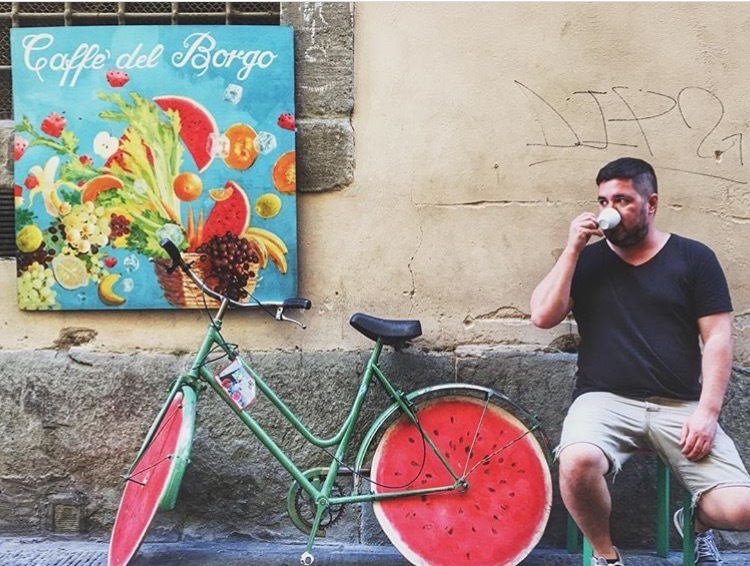 The food tour sounds like a great experience! Yum! Many of these sound delicious. I would be more than happy to partake in their national drink – beer! The Pogásca and Langos intrigue me the most as far as the foods go! My Grandmother was born in Budapest, and immigrated , at 4 yrs old, In 1907 thru Ellis Island with her parents. Her family surname was Baranyay. Both her parents were Hungarian. Her mother from Nagykanizsa, Zala , Hungary and her father from Kald, Vas, Hungary. My mother learned to cook a Hungarian goulash with a recipe her mother learned by her mother. It was called Szeged ( pronounced Zay Gay) or Szekely Goulash. It was made with pork, Hungarian sweet paprika, butter, onion, garlic, caraway seed, bay leaf, sauerkraut and sour cream. It was a favorite of mine. Sauerkraut was something all of us kids grew up liking. I doubt if my kids would touch it. It may be an acquired taste…like liverwurst/braunsweiger…..which I also love! My bucket list includes a visit to Hungary someday. I have heard how beautiful it is. I would love the food there also I’m sure! That’s so amazing that you have a family link to Budapest! You must go visit one day- the city is gorgeous. And that dish your mother made sounds delicious. My mom also loves sauerkraut and I’ve never cared for it so maybe it is a generational thing! I really hope you get to make it there one day soon! Just one thing: the Zay Gay pronuncation is the one for the Székely (allthough the right way is like Say Cay). Szeged sounds like … hmmmm it’s tricky. Gulya (goula) is the word for the cattle herd and gulyás (goulash) is the person who herds them. (The Hungarian version of the American cowboys :))They were the first who made these soups while they were out with the herd. And this is the reason why the true and real goulash is the one with the beef meat. Yes, we make it also with pork, but the real one is with beef. That photo of so-called Goulash Is Not GULYASLEVES ! There is No Such dish as “GOULASH ” in Hungary ! Hungarians are insulted by nonHungarians reference to Goulash. Tricia- thank you for the comment but my Hungarian tour guide helped me with this post and this is how he identified the dish and he did not seem insulted by the name.